With its proximity to schools, nature, shopping and entertainment, master-planned Tsawwassen Shores is undoubtedly a family-friendly community. The first phase of Tsawwassen Shores is currently under construction in Delta, a community that’s known for its excellent schools and academic accomplishments. When families begin to move into Tsawwassen Shores, their children will likely attend Ladner Elementary and Delta Secondary Schools, located just 10 minutes north of the 2,200-home development. Ladner Elementary is a dual-track school offering two complete programs from Kindergarten to grade 7, one in English and the other in French. Currently, 420 students attend Ladner Elementary, with approximately 50 per cent of students enrolled in the French Immersion program. After graduating from Ladner Elementary, students will be enrolled at Delta Secondary for grades 8 to 12. Delta Secondary offers a well-rounded education, with courses and programs in a broad range of fields such as academics, athletics, business, technology, career preparation, culinary arts, digital media arts, dance, theatre, and music. And less than five minutes away from Tsawwassen Shores is Southpointe Academy, a Kindergarten to Grade 12 school that the Fraser Institute ranked as one of the best in the province. Besides the nearby schools, another reason why Tsawwassen Shores appeals to families is because of the 1.8-million-square-foot shopping centre Tsawwassen Mills by Ivanhoé Cambridge, which is being built just down the street from the development. The mega-mall will follow the Mills concept modeled after Vaughan Mills in Toronto and CrossIron Mills in Calgary. The mall will boast plenty of family-friendly stores like Pro Hockey Life, Toys “R” Us, Winners, HomeSense and Indigo Books & Music. Ocean-side Tsawwassen Shores will also have its own village centre with services and facilities such as a cafe, library, community market, and administration and support services. 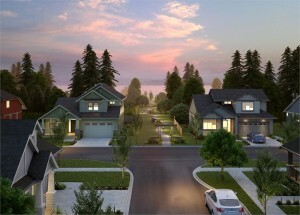 Register online or call 604 943 6677 to set up an appointment to view Tsawwassen Shores model homes and sales centre, located at 1875 Tsawwassen Drive. For more information call 604 943 6677, email info@tsawwassenshores.com or visit their website here.